At our core, the mission of Haiti180 is to create the opportunity to form well educated leaders of faith for the future of Haiti and to make sure every child in our care has a childhood that is filled with love and joy. 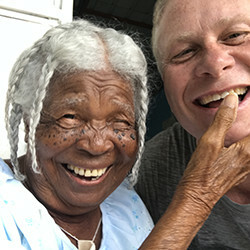 With your love, support, and prayer, we have been blessed with the opportunity to broaden our focus, reaching out to the poorest of the poor from the young to the old professing God’s love through our developments in education, medical care, housing, and so much more for the kind and loving people of Haiti. We are the hands and feet of Jesus Christ and together, we can turn it around. Kay Mari (which means House of Mary) is named for the model of love and tenderness as seen by Jesus’ mother that we strive to imitate. Child Services of Haiti told us we were one of the best children’s home they had ever seen because of the joy of the children and its cleanliness! Now caring for over 40 children, most arrived at our gates near death with no smiles. We thank God because now it is their smiles that light up Kay Mari with peace and joy! 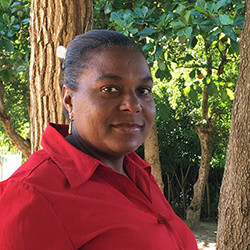 Meet Jeanita – (pictured here) – Jeanita came from the hardships of Port-au-Prince to Kay Mari in 2012 after the death of her parents and transitioned to life here immediately! Her bright and joyful personality lightens up the house! 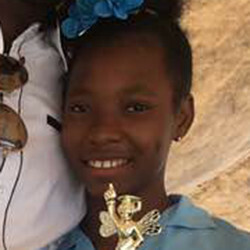 Despite her difficult upbringing, she is now getting almost perfect grades in school and was the 2017 Spelling Bee champion of all the schools within the surrounding villages! Before this beautiful school was established the children went to school in run down shacks with leaky roofs. Immaculate Conception school now educates 350 children and you can see their sense of dignity and pride as they enter the classrooms. Our curriculum is top notch and our teachers are excellent! The children will speak three languages when they graduate! Meet Guergelor – (pictured here) – Guergelor is the oldest of 5 children. They live in a hut with their parents but have very little to eat and were unable to go to school because they couldn’t afford it. Since the opening of Immaculate Conception School, they are able to be educated in a safe and loving environment and fed in the school lunch program! 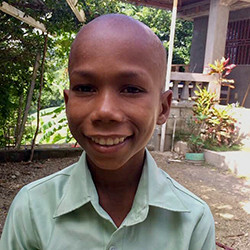 Guergelor is flourishing in school and has finished top of his class every year since he has been with us at Immaculate Conception! Many elderly people die alone in the mountains from starvation and loneliness. Parents can’t feed both their children and grandparents so the elderly often go without. Our homes will help the abandoned elderly find a place of rest and comfort. They are treated with dignity and love and have instant grandchildren from the children’s home. It’s a beautiful match! Meet Filo – (pictured here) – When we met Filo, she was living in a hut by herself, begging for food from anyone who passes by. She had been blind from cataracts for more years that she can remember and had lost all hope of ever seeing again. When she came to Kay Martina, she was reserved and quiet. Not only is she being bathed, fed three meals a day, and being cared for, but she has had the surgery she needed and can now see! She is overflowing with happiness and joy and most days you can hear her singing out her praise and thankfulness to God! We have just finished a medical clinic that can treat and care for the people in the villages of Duverger and Dandann. This massive structure of healing will allow women to give birth in a safe environment instead of alone in shabby huts. We will be able to perform small procedures, blood work, dental care, eye exams, and take x-rays. This clinic will save countless lives and give the villagers a place closer to home for treatment instead of having to walk for many hours to find help. Meet Anna – (pictured here) – Anna is our chief nurse.